We are the leading exporter and wholesaler of Forged Fittings .The products that we deliver to our clients are made from supreme quality raw material. In order to ensure the quality, the products are approved by ASTM and IBR standards. 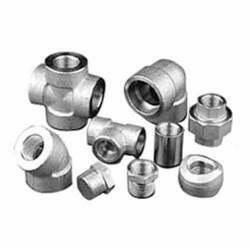 The exclusive range of products offered by us involves forged fittings. We offer our esteemed clients a comprehensive range of Forged Fittings, which are made by using high quality nickel alloys. The products are hot dip galvanized and electro polished and are available in various sizes ranging from ½”NB to 4”NB IN. Along with the product, the clients can avail from us mill test certificate, which is as per EN 10204/3.1B. The various types in which the product is available involves socket weld(S/W) and screwed (SCRD) - NPT, BSP and BSPT in half and full boss form. Forged Fittings are made in compliance with the following standards ASTM / ASME SB 564 / 160 / 472, UNS 10276 (HASTELLOY C 276 Boss), UNS 2200 (NICKEL 200 Boss), UNS 2201 (NICKEL 201 Boss), UNS 4400 (MONEL 400 Boss), UNS 8020 (ALLOY 20 Boss), UNS 8825 (INCONEL 825 Boss), UNS 6600 (INCONEL 600 Boss), UNS 6601 (INCONEL 601 Boss) and UNS 6625 (INCONEL 625 Boss). Looking for Forged Fittings ?